It’s a lazy Saturday in Seattle for me. I like days like these. It got up to a scorchin’ 72 degrees, which for Seattleites, that is actual heat. Yes, I fully agree that years of living in the Pacific Northwest has turned me into a weather wussy. 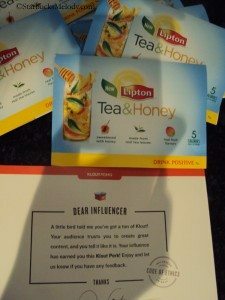 It was hot enough that I thought I’d try the instant “tea and honey” that Lipton sent me as a Klout Perk. And I realize that if you’re reading this blog, you’re likely surprised that I am not writing about Starbucks. Well, this is a an extremely rare occurrence to have a blog post not about Starbucks. I’ll find some way to tie it into my beloved Siren. For those who do not know, Klout is an online influence score, with scores ranging from zero to 100. I’ve read that 20 is about average. 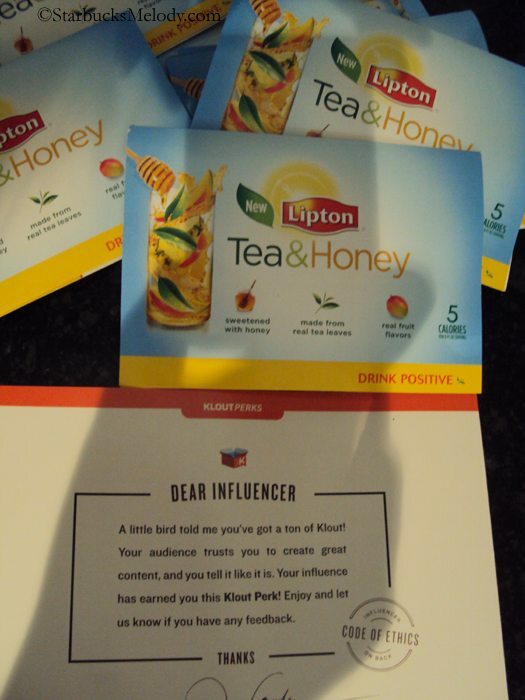 For a long time now, Klout has had partnerships with businesses where people who meet some standard of “influence” get free samples to try. I think at one time even Starbucks partnered with Klout, but believe it or not, this is the first time I’ve ever received anything from Klout. 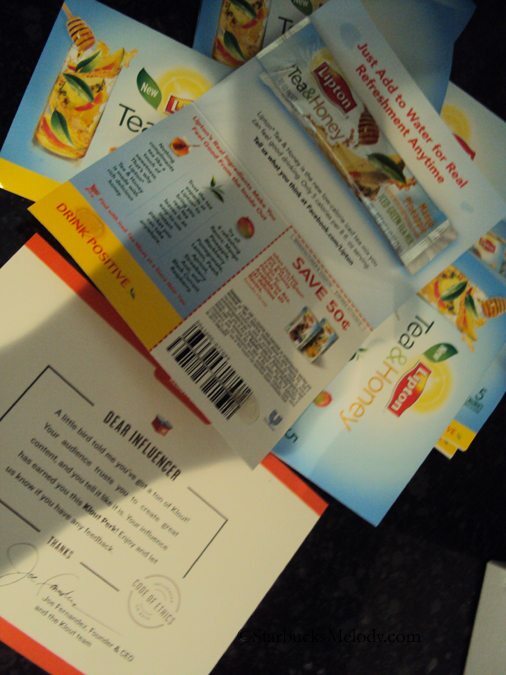 Lipton sent me Tea and Honey, Mango Pineapple instant tea. Each tiny sachet makes a single serving of instant tea. In Starbucks-speak, each sachet makes about a “grande” size glass of tea! Honestly, I thoroughly enjoyed my instant tea. I grabbed some cold water from the refrigerator, and stirred! It was ready to drink. I noticed that the mango seemed to be the most predominate flavor, and I did pick up a bit of the honey flavor too. Two thumbs up! Over time, I’ve slowly warmed up to the idea that maybe Starbucks could market some kind of instant tea. There was a time where I would have laughed that off as a silly idea, but oddly enough, somehow, I am coming around to the idea. Starbucks already makes a variety products, and I think the Tazo teas are wonderful, so why not? The Mango Pineapple tea was refreshing. That was a fun little perk! Okay, so what say you? Should Starbucks start making an instant tea too? Thank you for bearing with me as I talked about another brand! I promise I won’t do this again for a long time to come! I was given a free product or sample because I’m a Klout influencer. I was under no obligation to receive the sample or talk about this company. I get no additional benefits for talking about the product or company. Pleasures of Summer: A Starbucks recipe book from 1996. I think an instant tea is a great idea. I buy instant Nestea packages and use them throughout the summer. I like them for two reasons. First they are portable so I have them in my lunch bag, in my car and sometimes in my purse because they’re portioned to mix with a bottle of water, which is what I’d pick up somewhere on a hot day. The only thing I would worry about with Starbucks making instant iced tea is that iced tea is different regionally. Some areas of the country like it unsweetened, some like it sugary, some like it with lemon, some like it with sugar and lemon. So, while it could be formulated to meet one of those demands, surely they couldn’t create enough to meet all of them, and therefore it would likely sell well in certain areas and poorly in others. If Starbucks made instant tea I could see a fan base but I wouldn’t buy it as my preference is coffee. I had a coupon and tried the Lipton Tea & Honey Green Tea Blackberry & Pomegranate flavor. I wasn’t impressed as it was not sweet enough for me and I won’t be buying it again because the flavor didn’t make me want to buy more. Is the instant tea sweetened? If it is, does it use artificial sweeteners? I’d love to have an instant iced tea I could pour into water bottles to drink at work. Everything I find out there now to flavor water has artificial sweetener in it. I would happily drink unsweetened too! @Melody – Excuse me for saying so, but I’m having hard time taking this seriously. I can’t help but find humor in this whole thread. “Weather Wussy? Scorchin’ 72 degrees?” Today in Chicago, it is expected to be more like July or August weather in the mid 90’s. Later I’m going to be feeling like a true Weather Wussy myself. I would love to enjoy that Seattle weather over this stuff here. Then you decide too wuss out with the Lipton Tea. That is just sacrilegious on your part. LOL!!!! I hope you realize that I say this all in jest. You just had me at “Wussy” and it gave me a good laugh to start the day. I hope you are enjoying your Memorial Day Weekend. Chgo – Truth be told, I am naturally silly in real life. I’ll probably be a giggly teenager girl when I’m 80 years old. There is a lot of silliness and jest in the tone of voice to this blog post. However, one thing that is serious, is that I think Starbucks could consider an instant iced tea. I guess I am a purist at heart and although I do buy bagged teas I tend to stay away from instant teas. I am glad to hear that there is an instant tea out there that is good. Is this a regional or national product? @chgo: she’s not kidding..she’s really terrified of being too hot! 😉 @Melody: I wish you well with hot-flashes etc…..when that happens. = hell. re: the tea. I vote a big NO for Sbux and “VIA TEA”. They’ve strayed wayyyyy too far from coffee already. I’m not trying to offend all you tea-drinkers, I just think Sbux needs to stop straying away…. @Melody – I like my tea plain and hot, w/ No sugar, No Dairy, No Honey! I never got into iced tea for some reason. However….. Iced Tea is very popular, especially those of the instant variety. So all kidding aside…. I agree that if they could get serious about Willow and Veranda, then Instant Iced Tea makes more sense to me. I have such mixed feelings about what SB should offer beyond their coffee. I totally agree that they need to continue to shine as far as creating the best coffee, but as someone that drinks tea, I do enjoy the opportunity to meet and make friends at a SB. I do question how far they have gone beyond their original business model and wonder if they totally realize the effect of doing this. Perhaps Melody a blog post could be offered re where has Starbucks gone and would you want it to return to its roots or move ahead? @chgo: nothing would surprise me that they might do. nothing. @Chgo & @Denise – It wouldn’t surprise me at all if they are developing an instant tea. That could be in R & D stage right now. We’re just not going back in time. Nordstrom will never be a shoe store only again. Starbucks will never be just coffee. At this point, I see in the future that Starbucks will preserve who they are in mostly the stores with Clovers and Reserves. There will always be coffee passion, but I think the grocery aisles, and some stores may eventually … in the very long run … look like a general beverage business. I don’t mean tomorrow, but if you wonder, where will Starbucks be in 10 years or 20 years? The variety of products will likely be surprising. @Melody — you forgot to mention that people in Seattle do not tan, they rust 😉 . Starbucks instant teas? Yes, it sure would follow Starbucks current business direction and today’s demographic that thinks that a microwave is too slow. Starbucks no longer wants to take the time to train an employee how to make a legendary beverage. If Starbucks wanted to remain true to its roots and the coffee and tea connoisseurs it would go back to manual espresso machines, Clovers in all stores, and enough employee coverage to keep the store clean and the coffee brewed. @Melody: I don’t think it’s “going back in time” to hold to most of the standards that you were built on. What many of us now think is that Sbux did‘sell its soul’. I think adding beer and wine, as one weird example, in big Clover stores, is not so much “progress”……I just wish they (Sbux) would put their energies and $$$ back where they, imo, belong. Of course, DadC..said it perfectly. and re: Nordstorm: at least here…their biggest boominest dept is still shoes. I have been thinking alot about the evolution of SB and the issue of training as Dad Cooks says. It is very interesting to me to see from one shift to another how partners interact with customers, how they make the drinks, and what their knowledge of the brand is. I also find that of late there is not as much continuity from one store to another which perhaps has to do with the SM as well as the DM. Employee coverage is a big area that needs attention. Labor is expensive, I suspect that there will be even more processes streamlined to increase productivity in the aim of reducing labor costs. And really? It’s not just Starbucks that’s doing this, it’s happening all over the place in every industry.